Beachfront Condo with Free Beach Chair Service! TWO King Beds! Family Friendly! Complimentary Beach Service March 1-October 31! Free Wifi throughout resort! 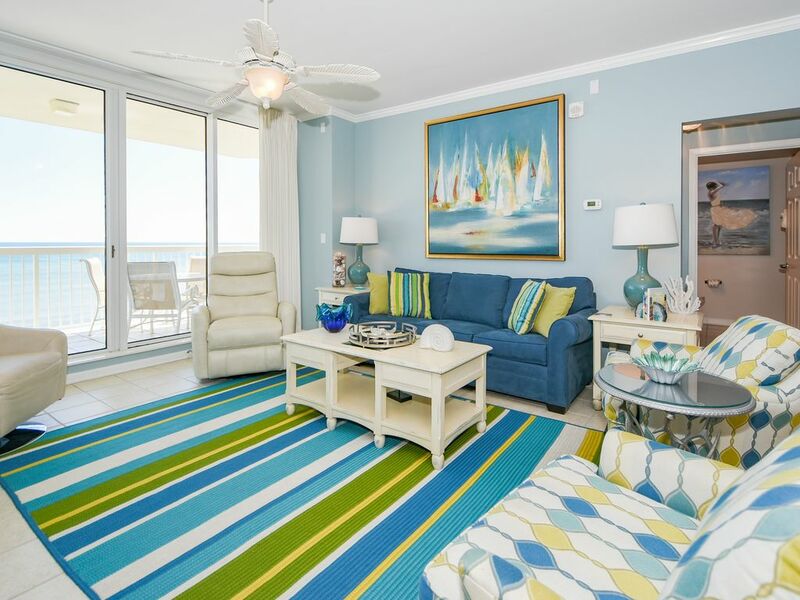 This beautiful condominium has Gulf-front views from both Bedrooms and your private Balcony will host amazing sunsets with a 180-degree view of the emerald waters and sugar-white sands of Northwest Florida’s Gulf Coast. Silver Beach Towers West 805 has been COMPLETELY RENOVATED with new paint, wood plank flooring, granite countertops, and all new furnishings! You will treasure the moments that become lifelong memories at the outstanding Silver Beach Towers West 805! The wall-to-wall, floor-to-ceiling windows and sliding glass door in the Silver Beach Towers West 805 Living Room provide an almost unbelievable, room-wide view of the sparkling Emerald Coast! There are flat-screen TVs in the Living Room (60”) and both Bedrooms, and all are wall-mounted. Adjacent to the Living Room are the Dining Room and Breakfast Bar which are both spacious and provide ample room for all of your guests. The Kitchen has multiple upgrades to include the previously mentioned granite counter tops as well as cabinetry and stainless steel appliances. The Kitchen also contains a Keurig coffee maker and a programmable Mr. Coffee coffee maker. The Laundry Closet is just off of the Kitchen and is complete with a new full-sized GE washer and dryer set. The Master Suite has a coastal theme and features the main Bedroom with a new mattress and box spring, a large, walk-in closet, a private entrance to the Gulf-front Balcony, and a private Master Bathroom. The Master Bathroom is equipped with a double vanity, jetted tub, and a large, tiled walk-in Shower with bench seat. The Guest Bedroom sports a King Bed with all new furnishings, a large closet, and a private entrance to the Balcony. The Guest Bathroom is just around the corner from the Guest Bedroom and contains a walk-in Shower. There is a Queen Sleeper Sofa in the Living Room. Silver Beach Towers West 805 is an impeccable choice for those who wish to have a luxury beach-front vacation on the Emerald Coast! Founded in 2006, Compass Resorts offers travelers a wide variety of vacation rental homes in the greater Destin area. From 1 bedroom condos to 7 bedroom Gulf-front houses, all of our rental homes meet the highest Quality standards. Compass Resorts offers vacation properties in Central Destin, South Walton, Holiday Isle, and Okaloosa Island in sought-after communities like Destiny by the Sea, Dunes of Destin, the Silver Beach Towers Resort, Silver Shells Resort and Spa, Destin Towers, and many more. The Compass Resorts website provides detailed information about all of our communities and vacation homes - as well as local events, area information, and concierge recommendations. Our mission is to deliver the highest quality Vacation Rental Experience as measured by Guest satisfaction. We listen intently to the needs of our Guests, and do business fairly, honestly, and with the highest level of care. Each year, we welcome thousands of families to the Destin area, and we enjoy making them feel right at home. The dedicated staff of Compass Resorts makes the difference! Silver Beach Towers Resort is a family-oriented, luxury, Gulf-front condominium located in central Destin, Florida. Silver Beach consists of two amazing towers of beautifully furnished vacation condos and great amenities. As the Official Onsite Agency for Silver Beach Towers, we offer many luxury condominiums in a variety of floor plans at this popular resort. 1 Assigned spot in covered garage. Additional unassigned parking available at lobby level. Kitchen and bath towels are provided. Guests should bring their own pool and beach towels. 2 additional seats available at the breakfast bar. The room had been recently updated and done so very nicely - tasteful colors, accents and furniture. The room was clean and has a great view of the gulf. The room is on the 8th floor, which is just right - not too high and not too low. The owner is great to work with as are the people at Compass. The property is top notch, with good parking, very accessible elevators that always work, an awesome pool and a nice grilling area. Our family had a great time with no problems to distract us, which is always a huge plus! We have come to Silver Beach Towers for many years and we will look for this particular unit when we return. Dad, Mom and Kids just fell in love with unit immediately upon arrival. Beach and views were amazing.Small issues with jacuzzi tub, closet door and wifi, but easily overlooked when compared to the rest of unit and condo grounds.Will definitely book again!! related to the rental is due 30 days prior to arrival.